Extraction of the wisdom teeth involves opening the gum tissue and removing any bone that covers the tooth. The connecting tissue will be separated so that the entire tooth can be removed. The area is then sutured closed and covered with gauze to control bleeding. Dental anesthesia can be administered through several different methods to reduce or eliminate discomfort during dental procedures. Your dentist will determine which type of anesthesia is best for you based on the type of procedure and your personal preferences. Local anesthetic is injected into the mouth to numb the area being treated to block the nerves that transmit pain. It is commonly used during fillings, treating gum disease or crown preparation. Sedation is administered by inhaling nitrous oxide, or laughing gas. This form of anesthesia is commonly combined with local anesthetic to help relieve anxiety. General anesthesia is the strongest form of anesthesia available for dental procedures. It involves intravenous drugs that produce a temporary loss of consciousness. Dentoalveolar surgery relates to procedures of the teeth and bones of the mouth, especially extractions and for supportive measures. Orthodontic Exposure is a surgical procedure performed on teeth that are unerupted or impacted. Your dentist will first place braces on the teeth to open up space for the impacted tooth and surgically expose the crown of the tooth by removing gum tissue and overlying bone. The dentist repositions the tooth with additional orthodontic treatments. The entire exposure process usually takes about two years to complete, but prevents unnecessary tooth loss. Tori removal entails reducing the amount of bone that has built up on either the upper or lower jaw. Associated with bruxism, tories fluctuate in size. A laser that can safely eliminate all excess bone, as well as soft and hard tissue in the area without damaging any nearby structures, is usually used by your surgeon during this procedure. After the removal is complete, the laser can be used to reshape the tissue before suturing takes place. Temporary anchorage devices are used in orthodontics to provide extra support needed to correctly shift a tooth. It is a system of small screws that are embedded into the bone acting as an anchor. Using a topical anesthetic, the devices are inserted into the bone between the roots of teeth or on the palate. Temporary anchorage devices can also speed treatment time and minimize the need for space maintainers or headgear appliances. Using the teeth are being investigated in therapies for a myriad of conditions.Teeth are one of the most abundant sources for stem cells in your body. These undifferentiated, immature cells have the ability to grow into any type of specialized cell. Loose baby teeth, wisdom teeth removal or a scheduled tooth extraction provide perfect opportunities to bank stem cells found in the pulp of your teeth. Following an extraction, your tooth is placed in a StemSave’sTM recovery and transport system. This keeps your tooth healthy and nourished while it is being sent to the lab, where the viability of the cells is tested. If the cells are healthy, they will be cryogenically preserved, stored and monitored until the stem cells are needed. A biopsy is performed to remove a sample of tissue from a solid mass to determine whether it is malignant or benign. In an incisional biopsy, a portion of the mass is removed for examination, and in an excisional biopsy, the entire growth is removed. Oral cancer surgery involves the removal of the cancerous tissue and some of the surrounding healthy tissue to ensure thorough eradication of the disease. Oral cancer surgery may cause swelling and bruising affecting the patient’s ability to chew, swallow or talk. Often, chemotherapy is administered after surgery using medication that targets cancer cells over repeated treatment sessions. Similarly, radiation therapy may also be used to destroy cancer cells. 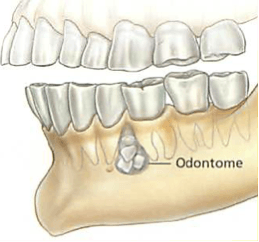 Orthognathic surgery is corrective jaw surgery to align the jaw that does not “fit” properly. In most cases, teeth will be straightened with with orthodontics, then corrective jaw surgery is performed to reposition the misaligned jaws. This surgery not only improves facial appearance, but also ensures that teeth meet correctly and function properly. Facial trauma is any injury to the face, teeth, gums or jaw line. These injuries can include facial cuts and lacerations, broken teeth, fractures, loose or missing teeth and socket bleeding, as well as jaw and soft tissue damage. Your dentist will likely perform a series of X-rays to evaluate the extent of damage and determine the best treatment option. Treatment for dental trauma depends on the type and severity of the injury. Dental restorations such as crowns or bridges may be used to repair chipped, cracked or broken teeth. A broken jaw may require surgery to realign the bone and allow for proper healing. Any type of facial trauma should be treated immediately to prevent further damage. Cosmetic facial surgery involves the treatment of problems affecting the mouth, teeth, gums, jaws and related facial structures. Patients with these conditions may have an abnormal or unbalanced facial appearance, and may have difficulty chewing, swallowing or speaking. The goals of cosmetic facial surgery are to treat the problem and achieve the most aesthetically pleasing results possible. Some examples of these procedures are tooth extractions and replacements, orthodontics, bone grafting, orthognathic and reconstructive surgery, and treatment of traumatic injury, cancers and oral diseases. TMJ disorders affect the temporomandibular joint and are characterized by chronic facial pain, clicking noises when opening the mouth, headaches and neck aches. If conservative treatments are not effective, there are several surgical options available. Arthrocentesis is a surgical procedure that drains fluid from the joint with a sterile needle and syringe. This may be performed under local anesthetic and helps relieve inflammation and pain. Arthroscopic surgery, with an arthroscope, allows visualization of the joint. As a result, there is less risk and faster recovery than with open surgery. When extensive repair is needed, traditional open surgery may be the best procedure. It provides the surgeon with full visualization of the joint and enables wide-ranging treatment of both the bone and the soft tissue. Bone grafting is a regenerative treatment for patients who have lost quality and quantity of supporting bone tissue. During the procedure, the gums will be separated from the teeth to gain access to the tooth roots and underlying bone. The roots will be thoroughly cleaned and any holes or damaged areas of the bone will be filled with a graft material and protected with a barrier. Once the graft is in place, the gums will be reattached to the area with sutures. Soft tissue grafting can also be used to provide stability in the jaw. It can restore the appearance of the mouth and reduce the risk of gum and bone collapse. A soft tissue graft may be performed to improve gum health and reduce the risk of root decay that is caused by a receding gum line. Platelet-rich plasma (PRP) contains proteins that can initiate and accelerate new tissue growth. Injecting PRP into damaged tissue is an effective yet minimally invasive treatment option. By enhancing the body’s natural healing abilities, patients are able to enjoy a faster and more thorough healing process. Bone morphogenetic protein (BMP) is a treatment used to stimulate bone growth and achieve more successful results. This group of protein extracts, found naturally in the body, can be created by doctors and placed in damaged areas, in concentrated quantities, in order to fuse the bone ends together.